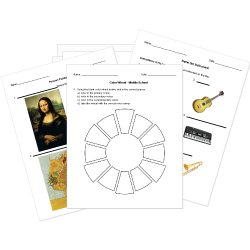 You can create printable tests and worksheets from these Grade 9 Arts questions! Select one or more questions using the checkboxes above each question. Then click the add selected questions to a test button before moving to another page. Which notes are on the 1st and 2nd lines of the treble clef? What is the key signature for the key of F? A person who designs dance for the stage. Alanna is practicing a Contemporary dance that uses her arms, head, and torso. This is an example of what element of dance? A line that connect two notes of the same pitch is called a tie . Andy Warhol is best known for his depiction of what grocery store item? A natural sign cancels a sharp or flat within the same measure. Complimentary colors are side by side on the color wheel. What is the interval between the notes C and F? Monochromatic means using only one color. Measures are small divisions in a piece of music. The time signature tells where to place the divisions. A design element that includes geometric, organic, or abstract shapes that are 2-dimensional. Warm colors are yellow, red, and orange. In (C) position, if finger #1 in the right hand is on middle C, what note would finger #4 correspond to?